Under Siege is mainstream Hollywood action that even people who are not typically action movie fans have seen. It was wildly popular at the time, despite the fact that it’s the first Seagal movie to break with the “Three Word Title” tradition. Seagal re-teamed with Above the Law (1988) director Davis – who also directed Chuck Norris in Code of Silence (1985) – and the results have that glossy, professional Hollywood sheen to it that even action movie “noobs” will find palatable. The fact that Davis’s next film was The Fugitive (1993) makes sense; it’s a natural extension of the groundwork laid down with Under Siege. Most of the street-level grit found in the early clutch of Seagal titles such as Out For Justice (1991) is missing here, presumably in a bid to garner a larger audience. It seems to have worked, even though Seagal’s viewing public was already pretty darn huge at the time. While the movie does lose a bit of steam towards the end because it doesn’t have to be as long as it is, all in all Under Siege is solid. It’s nothing to go wild about, but it’s like the USS Missouri itself: big, solidly built, steady, and professionally cared-for. To Under Siege’s eternal credit, it’s not a submarine slog, bogey slog, ship slog, or any other kind of slog, which it easily could have been. It’s simply what we call a “DieHardInA” movie, which were everywhere in the 90’s. It seemed every time you turned around, terrorist bad guys were taking over buildings, ships, nuclear plants, water treatment facilities, PathMarks, Waldenbookses, CompUSA’s or any other kind of structure that holds human beings. For a more in-depth look at the 90’s DieHardInA trend, please see our review of Sudden Death. In that case it was a hockey rink, in case anyone needed reminding. One of the main reasons Under Siege stays afloat (sorry) is the cast. First off, we have our old buddy Seagal, who is actually pretty likable here and you do root for him. 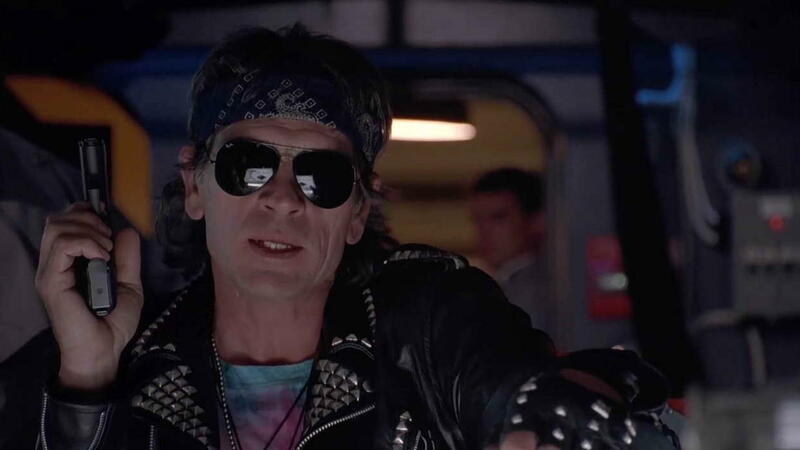 He’s backed up by the spunky Eleniak as his sidekick, and on the baddie side we have Tommy Lee Jones, who of course is excellent as the evil Strannix, and he has Gary Busey as his sidekick. Now that’s a power-team if there ever was one. Colm Meaney as another bad guy adds color, as do other incidental characters played by familiar faces such as Bernie Casey, George Cheung, Nick Mancuso, Andy Romano, and Dale Dye, among many others. Interestingly, Tommy Lee Jones gets into a knife fight with Seagal in the climactic battle, and Jones also played a knife expert in The Hunted (2003), and those to date are the only two TLJ movies on Comeuppance. Overall, by our standards at least, the violence is relatively toned-down. Sure, Seagal tears somebody’s throat out and shoves another guy into a circular saw, but somehow it all feels more muted than usual. 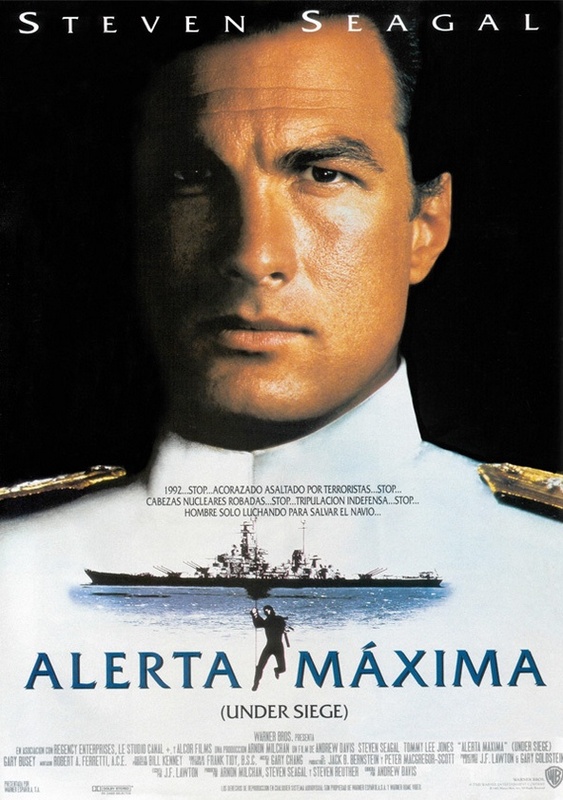 Under Siege was perhaps the peak of Seagal’s Hollywood career and is not bad by any means. It’s a bit mainstream for our personal taste but if you’re trying to get a non-action fan into action movies, this is a good and easy way to break them in to the genre. I have exactly the same feelings about this movie. It is solid, well-produced, well-shot, etc., but it lacks the ultra-cool, ultra-violent, gritty mood of Marked For Death and Out For Justice. You totally get it, happy we're in agreement as usually is the case.